In this study we focused on the structure and expression of the HLA-E, F, and G class I complexes in placental tissue. Structural analysis included an examination of the peptides bound to soluble and membrane forms of the HLA-G complex isolated directly from placenta. An important distinction was observed from HLA-G bound peptides previously isolated from transfectant cells. Thus, the number of distinct moieties bound to placental-derived proteins was substantially lower than that bound to transfectant-derived HLA-G. Indeed, a single peptide species derived from a cytokine-related protein alone accounted for 15% of the molar ratio of HLA-G bound peptide. To further examine HLA-E and its potential to bind peptide, notably that derived from HLA-G, we combined new Abs to examine expression in placental tissues for all the known forms of the nonclassical class I molecules. Whereas membrane HLA-G was found in extravillous trophoblasts, soluble HLA-G was found in all placental trophoblasts, including villous cytotrophoblasts and syncitiotrophoblasts. Further, HLA-E was found in all cells that expressed either form of HLA-G, consistent with HLA-E being complexed with the HLA-G signal sequence-derived nonamer in these cells. Finally, using new reagents specific for HLA-F, a restricted pattern of expression was observed, primarily on extravillous trophoblasts that had invaded the maternal decidua. Comparative staining indicated that HLA-F was on the surface of these cells, defining them as the first to demonstrate surface expression of this Ag and the first cell type identified to express all three nonclassical HLA class I Ags simultaneously. Pregnancy represents one of the most interesting examples of immune accommodation seen in mammalian biology. The placenta provides a barrier between the mother and child, preventing maternal immune cells from entering the fetal compartment at a time when its own immune system is immature or absent. Trophoblast cells of the placenta invade deep into the maternal uterine tissue to establish a life-giving connection with the maternal blood supply (1). HLA-G has long been assumed a major factor in this immune accommodation because of its localized expression and because of low levels of allelic polymorphism (2, 3). However, little has been elucidated about the expression of the other nonclassical class I molecules, HLA-E and HLA-F, in the placenta, and no studies on peptide bound to any of the nonclassical complexes as they are expressed in the placenta have been reported. It has long been established that two protein forms of HLA-G are expressed in the placenta, a membrane form and a soluble form, the latter containing an altered carboxyl terminus (4, 5, 6, 7). Protein expression has been consistently detected on extravillous cytotrophoblast, although detection of expression in the underlying villous cytotrophoblast has yielded contradictory results (2, 8). A second nonclassical class I protein, HLA-E, is surface expressed on all cells and tissues that express classical class I and on transfectants that express HLA-G (9), and expression on placental cells has been implicated indirectly (10), whereas a definitive examination of cellular distribution in the placenta remains to be completed. HLA-F, the third human nonclassical class I protein (11), has been detected intracellularly in a number of cell lines, but surface expression appeared to be lacking (12, 13). HLA-F protein expression in normal tissue has been little examined, and no studies of expression in placental tissue have been reported. The function of HLA-G has been suspected of being related to its low allelic polymorphism and restricted tissue distribution, features considered fundamental to its role in accommodating the maternal immune response. However, perhaps surprisingly, to date there is little compelling evidence of a unique function for HLA-G in the placenta (14). In studies of transfectant cell lines, it was shown that HLA-G binds a diverse array of peptides (15, 16) and is able to bind CD8 (17, 18) together, suggesting that it might present Ag to T cells. However, no human CTL reactive with HLA-G has been found. Whereas there are reports of T cell interactions of soluble HLA-G (S · HLA-G) 3 possibly mediated through CD8 (17, 19, 20), whether this is a property specific to S · HLA-G or fundamental to the placenta remains to be demonstrated, and in any event, the effect was apparently not mediated through TCR. In transfectants, HLA-G tetramers bound to inhibitory Ig-like transcript (ILT)2 and ILT4, suggesting an active role through this receptor (21). Several studies have been conducted demonstrating the ability of HLA-G to protect transfected NK targets from lysis (22, 23, 24), and this is now thought to be mediated through an interaction with the NK receptor, killer Ig-related receptor (KIR) 2DL4 (25, 26). However, a confirmation of this latter interpretation is still pending. Progress understanding the biology of HLA-E has yielded definitive data about the function of this molecule. We previously showed that the availability of a nonamer peptide derived from certain HLA class I signal sequences is a necessary requirement for the stabilization of endogenous HLA-E expression on the surface of 721.221 cells (9). It was possible to implicate the CD94/NKG2A complex as an inhibitory receptor, recognizing this class Ib molecule by using as the target a .221 transfectant selectively expressing surface HLA-E (27). An interesting result that may connect the functions of HLA-E and G is the observation that when HLA-E is provided with the HLA-G-derived nonamer signal peptide, a unique activatory response from NK cells can be observed (28). These results raised the possibility that CD94/NKG2-mediated recognition of HLA-E expressed on extravillous cytotrophoblasts plays an important role in maternal-fetal cellular interactions. At present, no functional data for HLA-F have been reported, although an interaction with ILT2 and ILT4 has been implicated (12). To examine the role of all three nonclassical class I Ags in the maternal immune response during pregnancy, we have developed mAbs specific for the membrane HLA-G (M · HLA-G), S · HLA-G, HLA-E, and HLA-F, and used these mAbs in a comprehensive examination of protein expression in placental tissues. To gain further insight into the function of these molecules, we examined peptides bound to both S · HLA-G and M · HLA-G isolated directly from placenta, data that confirm the previously described HLA-G peptide binding motif, but indicate a peptide profile distinct from that found in transfected cell lines. Further, HLA-E was found in all cells that expressed either form of HLA-G, indicating that HLA-E is indeed complexed with the HLA-G signal sequence-derived nonamer in these cells. Finally, using new reagents specific for HLA-F, a restricted pattern of expression was observed, primarily on extravillous trophoblasts that had invaded the maternal decidua. Comparative staining of these cells indicated that HLA-F was on the surface of these cells, defining these cells as the first normal cell type to demonstrate surface expression of this Ag. The anti HLA-E reagent 4D12 was generated using HLA-E protein as Ag in essentially the same manner as previously described in Lee et al. (9). Similarly, olG was identified after several screens of anti-HLA-G preparations as was described for the production of 87G (15). To obtain HLA-F protein for immunization, refolded HLA-F complex was produced as described previously for the production of recombinant HLA-E (29). Briefly, the full length of HLA-F cDNA was fused to sequence coding for a GlySer linker, and a BirA substrate peptide (30) was fused to a cDNA encoding 276 aa of the HLA-F H chains (excluding the signal sequence) by PCR and expressed in pHN1+ vector and expressed in Escherichia coli strain UBS. β2-Microglobulin (β2-m) in pHN1+ was kindly provided by D. C. Wiley (Harvard University, Cambridge, MA) and expressed in E. coli strain XA90. Both H and L chain inclusion bodies were isolated from cell pellets, washed repeatedly in detergent, and the resulting protein solubilized in urea. To generate HLA-F-specific reagents, 6- to 8-wk-old female BALB/c mice transgenic for human β2-m and HLA-B27 (15) (The Jackson Laboratory, Bar Harbor, ME) were immunized i.p. with 20 μg of refolded HLA-F H chain plus β2-m mixed with CFA (Sigma-Aldrich, St. Louis, MO). After the first immunization, mice were immunized four times using 20 μg of complex mixed with IFA (Sigma-Aldrich) at 1-wk intervals. For the final injection, mice were immunized i.v. with 30 μg of complex without adjuvant. Their spleens were removed 4 days later for fusion. Spleens were collected from three immunized mice. Spleen cells were fused with SP 2/0 myeloma cells at a 9:1 ratio using polyethylene glycol 8000 (Sigma-Aldrich). Cells were cultured in RPMI medium with 15% FBS, 2 mM l-glutamine, 1 mM sodium pyruvate, and 1% penicillin and streptomycin in 16 96-well plates at 0.1 ml/well. Hypoxanthine/aminopterin/thymidine (HAT) was added into culture after 3 days, and HAT selection was continued for 1 wk. Cloning was performed three times by limiting dilution in RPMI medium. Screening was done using HLA-F complex added to 96-well plates at 1.2 μg/ml, and plates were incubated overnight at 4°C. After the uncoupled sites were blocked with 5% skim milk in PBS, 100 μl of hybridoma supernatant was added to each well. HRP-goat anti-mouse was added at 1/2000 dilution in PBS/Tween 20, and 3′,3′,5′,5′-tertramethyl benzidine was used as a substrate (Sigma-Aldrich). The reaction was run at room temperature for 45 min and stopped by the addition of an equal volume of 1 M H2SO4. Hybridomas were screened by reading the yellow product at 450 nm using an EAR 400AT plate reader (SLT Labinstruments, Salzburg, Austria). Positive clones were subcloned, and secondary and tertiary screenings were done against refolded HLA-F plus β2-m.
HLA-F Abs were characterized by FACS staining of .221 transfectants expressing individually, HLA-A2, -B27, -B7, -Cw4, -Cw15, -E, and –G, and a panel of 40 normal HLA-typed PBMC expressing diverse HLA allotypes. No positive staining was observed in FACS on any of these cells for 3D11, whereas 4A11 showed cross-reactivity with a subset of HLA-Cw04 alleles (see below and Results). In addition, western analysis of E. coli-synthesized HLA molecules showed a strong reactivity with HLA-F, whereas no reactivity with similar preparations of HLA-E, -G, -A2, or -B7 proteins was apparent. In western analysis of a panel of human cell lines, a band corresponding in size to HLA-F in .221 (previously established by isoelectric focusing (IEF)) was apparent in some lines. That there was no cross-reactivity with other HLA in these cell lines was demonstrable because of the difference in m.w. of HLA-F and other HLA class I. One Ab, 4A11, showed cross-reactivity to HLA-Cw*0401, *0402,*0404, and *0405 but to no other HLA-A, -B, or -C allele (including Cw*0403 and Cw*0406). Sequence comparisons revealed a unique sequence in the α1 domain that was common to the four HLA-Cw4 alleles and to HLA-F, but absent in all other HLA class I.
Affinity purified Ab for coating (W6/32, 87G, o1G, 16G1) was diluted with 0.05 M sodium bicarbonate buffer (pH 9.5) at a concentration of 50 μg/ml. The 96-microwell polystyrene plates NUNC-Immuno Plate Maxisorp surface (Nalge Nunc International, Rochester, NY) were incubated with 50 μl of the Ab solution overnight at 4°C. The excess of the mAb was removed. The uncoupled sites were blocked with 100 μl of 2% BSA in PBS for 1 h at 37°C and washed three times with PBS + 0.05% (v/v) Tween 20. S · HLA-G and M · HLA-G, purified as described (15), were added in 50-μl volumes at various concentrations, and the plates were incubated overnight at 4°C. Supernatants were removed, and plates were washed four times with PBS + 0.05% (v/v) Tween 20, after which biotinylated mAb (W6/32, 87G, o1G, or 16G1) was added at 0.1 μg/ml. After 1 h of incubation at room temperature, plates were washed five times, and 50 μl of streptavidin-β-O-galactosidase conjugate (Invitrogen, San Diego, CA) at 1/12,000 dilution in 1% BSA-PBS were added to each well. After 1 h of incubation at room temperature, plates were washed five times, and 50 μl of 4 methylumbelliferil β-galactoside (Sigma-Aldrich) at 0.1 mM in buffer A (0.01 M sodium phosphate buffer (pH 7.0) containing 0.1 M NaCl, 1 mM MgCl2, 0.1% BSA, and 0.1% NaN3) were added to each well, and incubation was conducted for 2 h in a 37°C water bath. After addition of 0.1 M glycine-NaOH (pH 10.3), fluorescence was detected using a Cytofluor 2350 Fluorescence Measurement System (Millipore, Bedford, MA). Human placental tissue from normal first trimester placenta (5–12 wk of gestation, n = 20) was acquired from elective pregnancy terminations, and normal term placentas (37–39 wk of gestation, n = 5) were acquired from delivery, with informed consent. This study was approved by the Ethics Committee on Human Subjects of Nara Medical University where the work was performed. Tissue from first trimester and term normal pregnancy was cut into 0.5 cm3 blocks and fixed in 4% paraformaldehyde-0.1 M phosphate buffer (pH 7.4) for 2 h at 4°C with gentle stirring. The blocks were washed successively in 10% sucrose-PBS, in 15% sucrose-PBS, and in 20% sucrose-PBS for 40 min, each at 4°C, and imbedded in OCT compound Tissue Tech (Sakura Finetechnical, Tokyo, Japan) and snap frozen, and then sectioned onto silane coating slides. The section was air dried, washed with PBS, and incubated with a mAb as a primary Ab in 0.25 μg/ml (for w6/32) or 10 μg/ml (for other Abs) for 20 min at 25°C. After washing with PBS to visualize the reaction, the section was incubated with peroxidase-conjugated rabbit anti-mouse IgG secondary Ab (HISTOFINE SAB-PO kit; Nichirei, Tokyo, Japan) for 30 min at 25°C. The primary Ab was detected with peroxidase-conjugated rabbit anti-mouse IgG secondary Ab, yielding a brown color for positive staining. Control experiments included incubation of tissues with normal mouse IgG1 or IgG2a (BD Biosciences, San Jose, CA), replacing the appropriate isotype-matched primary experimental Ab. For 16G1 stains, control stains included the addition of the 20-mer peptide derived from the COOH terminus of S · HLA-G (7) at increasing concentrations immediately before addition of 16G1 to the immunostain. Total HLA-G protein was purified from the detergent lysate of two term placentas. Briefly, lysate was washed with PBS and mixed with an equal volume of solubilization buffer containing 2% Nonidet P-40, 0.8 M NaCl, 20 mM Na2EDTA, PMSF (2 mM), iodoacetamide (100 mM), pepstatin A (10 mg/ml), leupeptin (10 mg/ml), and aprotinin (5 mg/ml) in PBS. The tissue was gently agitated for 30 min at 4°C. Nuclei were removed by low-speed centrifugation at 1,500 × g for 5 min at 4°C, and the total protein concentration was adjusted to 2 mg/ml. The lysate was clarified by centrifugation at 100,000 × g, for 90 min. The M · HLA-G and S · HLA-G complexes were then purified by immunoaffinity chromatography using mAb 87G or 16G1 coupled to cyanogen bromide-activated Sepharose 4B. MHC complexes were eluted with 1% trifluoroacetic acid (TFA), and peptides were recovered by ultrafiltration using an Amicon cell with a 10,000 m.w. cutoff and concentrated by vacuum centrifugation. Peptides were purified on a model 140B narrow-bore HPLC system (Applied Biosystems, Foster City, CA) using a 1 × 100 mm C18 Vydac column at a flow rate of 100 ml/min at 40°C. Indicated fractions were rechromatographed using a 1 × 100 mm Spheri-5, RP-18 (5 mm) column (Applied 1 Biosystems) at a flow rate of 40 ml/min at 40°C. Linear acetonitrile gradients from solvent A (0.1% TFA) to solvent B (0.085% TFA in acetonitrile) were used for elution. Automated sequence analysis was performed in a pulsed-liquid protein sequencer (model 476A; Applied Biosystems) as described (31). Proteins were recovered from SDS-polyacrylamide gels by electroblotting onto a Problott membrane (Applied Biosystems), and quantitation was based on amino acid sequence analysis. Peptides were sequenced on polybrene-coated glass fiber discs. A database search of peptide sequences was performed using the GCG Sequence Analysis Software Package (Genetics Computer Group, Madison, WI). Mass spectra were recorded on a BioIon20 plasma desorption mass spectrometer (Applied Biosystems). A 5-ml aliquot of samples (3–10 pmol of peptide in TFA/acetonitrile) was applied to a nitrocellulose-coated target. Spectra were acquired for 10 million fission events at 15 kV acceleration voltage. The following cell lines purchased from the American Type Culture Collection (ATCC, Manassas, VA) (ATCC number follows in parentheses) or obtained from other investigators were chosen to provide a sampling of representative human tissues to examine for HLA-F expression, both surface and intracellular: 1) amnion, WISH (CCL-25); 2) bladder, J82 transitional cell carcinoma (HTB-1); 3) colon, CCD-841 CoN (CRL-1790); 4) lymphoblast, MOLT-3 T cell leukemia (CRL-1552); 5) lymphoblast, U937 T cell lymphoma (8); 6) placenta, JEG choriocarcinoma (HTB-36); 7) placenta, BeWo choriocarcinoma (CCL-98); 8) skin, 3A-subE SV40 transformed (CRL-1584); 9) thymus, Hs68 (CRL-1635); and 10) positive control, 721.221 (32). Cells were cultured according to the supplier’s directions. All cultures were maintained in 5% CO2 at 37°C. FACS analysis of cells and western blot analysis of cell lysates from these lines were performed essentially as described (9) using anti-HLA-F reagent 3D11 and confirmed with 4A11 where cross-reactivity was not an issue. Briefly, cells were lysed in 10 mM Tris (pH 7.5), 140 mM NaCl, 1% Triton X-100, 0.1 mM PMSF, 10 μg/ml pepstatin, and 14 μg/ml aprotinin at 20 × 106/ml. Lysate from 45 × 104 cells was loaded to each well, and proteins were transferred to nitrocellulose membrane (Schleicher & Schuel, Keene, NH). HLA-F protein was detected by mAb 3D11, followed by HRP-labeled goat anti-mouse Igs (BioSource International, Camarillo, CA) at 1/5000 dilution, and visualized with an ECL system (Amersham, Arlington Heights, IL). Frozen tissues from five separate term placentas were sectioned into 5 μm using a Cryostat and then air dried and fixed in cold acetone for 30 s. After washing once with 0.01 M PBS containing 0.01% Tween 20, the sections were incubated with anti HLA-G Ab (87G) at 10 μg/ml for 20 min at 25°C and washed with PBS three times. For detection, the sections were incubated with anti-mouse IgG Ab conjugated with FITC (Tago Scientific, Burlingame, CA) for 30 min at 25°C. After incubation and washing with PBS three times, the sections were incubated with anti HLA-F Ab (3D11) at 10 μg/ml and labeled with Cy3 using the Fluorolink Mab Cy3 labeling kit (Amersham Pharmacia Biotech, Buckinghamshire, U.K.) for 20 min at 25°C. After incubation and washing with PBS three times, these fluorescence were detected with a Laser Scanning Confocal Imaging System (Bio-Rad, Tokyo, Japan). For several years we have attempted to meet the need for Abs specific for the nonclassical Ags and have ultimately been successful in doing so. In this report we describe additional new Abs against HLA-E and G as well as two new anti-HLA-F reagents. The Abs we previously generated that we and others have used extensively in the past and those generated in this report are listed in Table I⇓. An additional reagent specific for HLA-E (4D12) was isolated in a manner essentially similar to that described by Lee et al. (9). This reagent has the useful characteristic of binding to an epitope on the HLA-E complex that is distinct from that bound by 3D12. In addition to binding the HLA-E complex, 4D12 also binds to the denatured Ag in western analysis. For HLA-G analysis, in addition to the widely distributed anti-HLA-G reagents 87G and 16G1 (15), a third reagent (olG) was developed to react specifically with the membrane form of HLA-G. When these three Abs were tested in sandwich ELISA experiments, it was apparent that although 87G reacts with both the membrane and soluble forms of HLA-G, and 16G1 reacts only with the soluble form as previously reported, olG is specific for the membrane form of HLA-G1 ((Fig. 1⇓). As a test of specificity, both olG and 4D12 were tested in FACS analysis using a panel of 60 lymphoid cell lines (LCL) expressing a broad array of HLA specificities (33). Neither Ab showed detectable cross-reactivity with other HLA Ags. 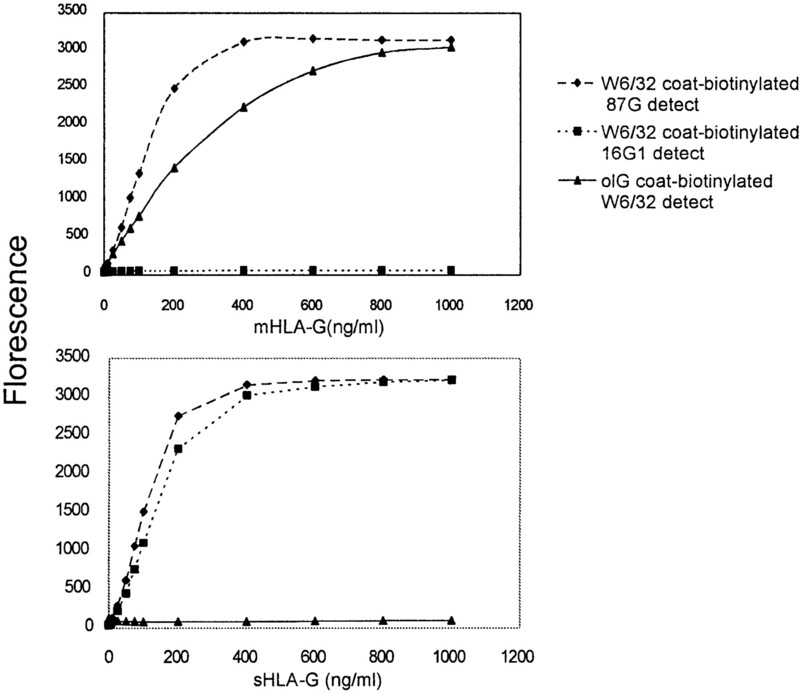 HLA-G-specific reagents can distinguish between the membrane and soluble forms of HLA-G. Various combinations of HLA-G-specific reagents and pan class I Ab W6/32 used alternatively in capture as plate bound and detection as biotinylated Abs. The information in the upper right contains the key for specific Ab combinations used to detect the alternative forms of HLA-G. Upper and lower graphs show results from membrane (M · HLA-G) and soluble (S · HLA-G) proteins as indicated. Purified membrane or soluble proteins were tested in increasing amounts as indicated on the horizontal axis, and fluorescent units detected as in Materials and Methods are indicated on the vertical axis. To obtain sufficient HLA-F Ag for immunization, we used recombinant HLA-F synthesized in E. coli and refolded with recombinant human β2-m as described in Materials and Methods. Because HLA-F was not detectable on the surface of .221 transfectant cells (32), a positive control for cell surface expression was not available. Therefore, our Ab screening method relied on an ELISA similar to that developed for HLA-G, using W6/32 as capture Ab and refolded recombinant HLA-F as Ag. From this screening we were able to identify two reagents that showed specificity when tested in western analysis and immunoprecipitation from LCL .221. These cells express only HLA-E and F (32), and thus it was possible to distinguish the HLA-F IEF pattern given the known and distinguishable HLA-E pattern (27). The m.w. of HLA-F is smaller than other class I because of the absence of exon 7 in the mature transcript (11), and thus HLA-F could be distinguished by m.w. as well. Reactivity with HLA-F was confirmed by IEF and by m.w. in western analysis and immunoprecipitation from normal LCL. When tested for cross-reactivity using FACS of a broad panel of LCL, no cross-reactivity was observed for 3D11, whereas 4A11 did react with a subset of HLA-Cw4 molecules. Further analysis showed that only the HLA-Cw*0401, Cw*0404, and Cw*0405, but not the Cw*0403 and Cw*0406, alleles were reactive. The presence of a glutamic acid at position 49 of the α1 domain in the reactive C alleles was also present in HLA-F. No other class I allele had this substitution, including the Cw*0403 and Cw*0406 alleles, suggesting the reactive epitope on HLA-F and the cross-reactive HLA-C proteins included this residue. Although limiting the usefulness of 4A11, such cross-reactivity did confirm the ability of the Abs to react with surface-expressed Ag. Some controversy has persisted about the expression of the nonclassical Ags in the placenta, both concerning HLA-G expression in placental-derived and nonplacental tissues as well as in distinguishing between HLA-G membrane and soluble forms. In addition, HLA-E expression has only been inferred in the placenta and not demonstrated directly (10). Therefore, our first goal was to test and establish optimal conditions to examine expression of these Ags in the placenta under well-controlled conditions that had proven reliable with several Abs. That these results are reliable is supported by the fact that we were able to control for reactivity in two ways, by competing with purified Ag when available and by confirmation with a second specific reagent. First, because 16G1 was generated against the carboxyl-terminal peptide of S · HLA-G, it was possible to test whether reactivity in histochemical stains could be blocked by the addition of synthetic peptide used to generate the Ab (Fig. 2⇓). For other Ags, we had a second Ab available, still specific but reactive, with a distinct epitope as in the case of 87G compared with olG for M · HLA-G and 16G1 compared with 87G, both detecting the soluble form. Similarly, expression of HLA-E could be confirmed using the new reagent 4D12, which binds a distinct epitope but otherwise shows a reactivity pattern essentially identical to that of 3D12 (Table I⇑). These two pairs of Abs were each shown to react with distinct epitopes by simultaneous FACS staining of an HLA-G- or HLA-E-expressing cell line (data not shown). HLA-E and the HLA-G membrane and soluble forms are differentially expressed in placental trophoblast cells. Results of histochemical staining with M · HLA-G-, S · HLA-G-, and HLA-E-specific Abs as described in Materials and Methods are presented. Serial sections of placental tissue were stained for the presence of S · HLA-G (16G1), M · HLA-G (olG), and both HLA-G forms (87G) and HLA-E (3D12). Control experiments included reactivity with pan class I Ab (W6/32), and isotype control Ab. 16G1 + pep refers to the addition of blocking peptide during staining as described in Materials and Methods. In addition to confirming the well-established expression pattern of M · HLA-G in extravillous trophoblasts, we were able to distinguish the membrane from the soluble form of HLA-G and observed differential expression of S · HLA-G. Whereas the membrane form could be found only in extravillous trophoblasts and not in villous trophoblast or syncitiotrophoblast, S · HLA-G was very evident in all trophoblast cells (Fig. 2⇑). We verified that this reactivity was specific for S · HLA-G by adding the same 20-mer peptide from which the Ab 16G1 was generated. As can be seen in Fig. 2⇑, increasing concentrations of peptide correlated inversely with signal in the placenta. Addition of the 20-mer peptide to 87G or o1G immunostains had no effect (data not shown). In addition, wherever HLA-G protein could be found, it was also possible to detect HLA-E protein. This pattern of HLA-E was consistent with its expression in all cells and tissues that express HLA class I, and confirmed that the potential of HLA-E bound to the HLA-G signal sequence nonamer might be expressed in the placenta (28). A closer view of S · HLA-G and HLA-E in syncitiotrophoblasts and the underlying cytotrophoblasts showed that although M · HLA-G is of low abundance or absent, S · HLA-G was clearly present within the syncytium and may also be expressed in the underlying cytotrophoblast (Fig. 3⇓). This confirms the interpretation of Chu et al. (8) and stands in contrast to that observed by others (2). At the same time, our analysis showed weak HLA-E expression, consistent with its expression in other cell types (27) that appears to be largely coincident with either the soluble or membrane forms of HLA-G. All results obtained using anti-HLA-E reagent 3D12 were confirmed with reagent 4D12 (data not shown). HLA-E and S · HLA-G are found in syncytium and cytotrophoblasts of the chorionic villi, but M · HLA-G is absent in these cells. Shown are expanded views of chorionic villi stained with specific reagents as described in the legend to Fig. 2⇑. Cytotrophoblasts (CT) beneath the syncitiotrophoblasts (ST) are indicated. Considering the differential expression of S · HLA-G and M · HLA-G, combined with previous findings about the diversity of peptide ligands bound to HLA-G in transfected cells (15), we were interested in obtaining both protein forms directly from the placenta and to examine them for diversity of peptide ligands bound. We have previously analyzed and compared the biochemical features of both S · HLA-G and M · HLA-G that are expressed in LCL 721.221 to understand their functional properties. Both proteins consisted of H and L chains complexed with nonameric peptides in a 1:1:1 ratio. The two proteins bind essentially the same peptides that are derived from a variety of intracellular self-proteins and define a peptide motif for HLA-G (15). To analyze the presentation of HLA-G-restricted peptides by human term placenta, HLA-G protein was isolated from two term placentas as described in Materials and Methods. From this preparation, a recovery of 900 pmol of M · HLA-G protein was determined for the membrane extract from placenta, and 850 pmol of SHLA-G was isolated from the soluble fraction using affinity columns with 87G and 16G1, respectively. Peptides bound to both proteins were released with 1% TFA, recovered by ultrafiltration, purified by reverse-phased HPLC, rechromatographed, and subsequently analyzed by Edman degradation. Both the S · HLA-G- and M · HLA-G-derived peptides were purified by HPLC, and individual fractions were analyzed by microbore HPLC/tandem mass spectrometry. Under the standard conditions used for analysis, individual mass spectra allowed identification and quantitation of ∼47 distinct ions in S · HLA-G and M · HLA-G extracts. Sequences were determined for three peptides extracted from each of placental S · HLA-G and M · HLA-G proteins. The peptides were nine residues long with Pro in position 3 and Leu in position 9, consistent with the previously identified motif. Two of the sequences (cytokine receptor and nuclear protein) were previously found in .221-G transfectant cells, whereas the relative abundance was far lower than that found from the placental-derived materials. It was apparent that a relatively small number of peptides bound the placental material compared with the .221-G proteins (∼400 distinct peptides). In addition, this was in part reflected in the relative abundance of individual peptides, which was remarkably high compared with typical class I. Indeed, the peptide derived from a cytokine receptor-like protein alone constituted up to 15% of the peptide bound to S · HLA-G (Table II⇓). As an initial survey for HLA-F expression, we obtained 23 cell lines from the ATCC that were representative of a variety of human tissues and examined them for HLA-F protein expression (see Materials and Methods for a complete listing). Nearly half of these cells expressed HLA-F as judged by western analysis at levels similar to that found in LCL .221 (Fig. 4⇓). Expression was not focused on any specific tissue or cell type, although two placental cell lines did express protein. However, like .221, none of these cells expressed HLA-F on the cell surface as evidenced by FACS analysis (data not shown), consistent with two other studies of HLA-F protein expression (12, 13). Protein was confirmed as HLA-F by m.w., using both 3D11 and 4A11 where cross-reactivity of the latter with HLA-Cw4 was not an issue (i.e., HLA-C reactivity was ruled out). HLA-F protein is differentially expressed in cell lines. HLA-F expression is detected in specific tissue-derived cell lines by Western blot analysis as described in Materials and Methods. Cell lysates derived from cell lines obtained from various tissues, as indicated above, are designated with numbers to indicate their origin as follows: 1) WISH; 2) J82 transitional cell carcinoma; 3) CCD-18 Co-5; 4) MOLT-3 T cell leukemia; 5) U937 T cell lymphoma; 6) JEG choriocarcinoma; 7) BeWo choriocarcinoma; 8) 3A-subE SV40 transformed; 9) Hs68; and 10) 721.221. All lines were obtained from the ATCC. The m.w. markers are indicated on the left. As our interest in expression of HLA-E, F, and G has been focused on the placenta and related tissues, we undertook an examination of HLA-F expression once adequate reagents were isolated and proven to be specific. Our first surveys looked throughout the placental environment in the same manner as with HLA-E and G. In this examination, low levels of intracellular HLA-F-specific staining was observed in syncitiotrophoblasts, villous trophoblasts, and extravillous trophoblasts (term placenta) that were not in contact with the maternal decidua (data not shown). However, when decidual tissue was examined with 3D11 in concert with anti HLA-G staining of serial sections, significantly higher levels of HLA-F could be detected in extravillous trophoblasts embedded within the decidua (Fig. 5⇓). We deduced these cells to be extravillous trophoblasts based on the overlapping staining of these cells with 87G, identifying them as HLA-G expressing extravillous trophoblasts. HLA-F is expressed in extravillous trophoblasts that have invaded the maternal decidua, but not in cytotrophoblasts still in the chorionic villi. 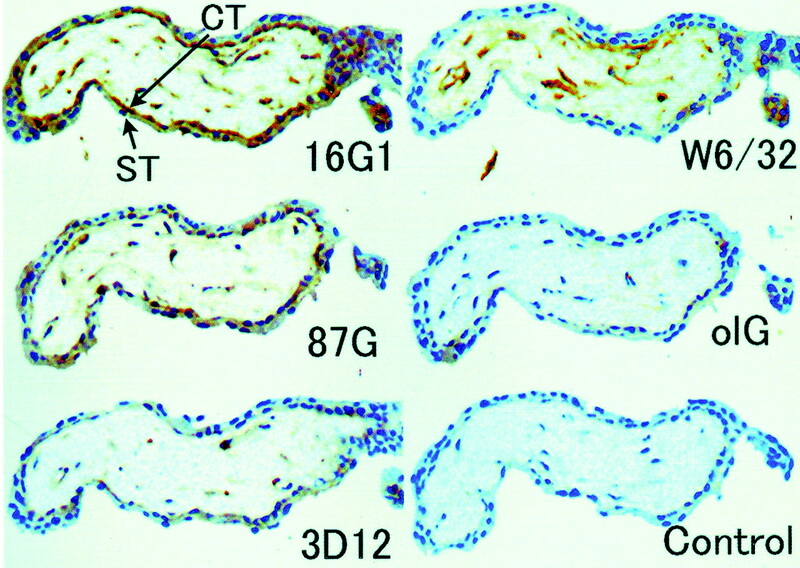 Serial sections of placenta with attached decidual tissue are shown stained with anti-HLA-F reagent 3D11 or anti-HLA-G reagent 87G, as indicated. Arrows are pointing to extravillous cytotrophoblasts within the decidua. 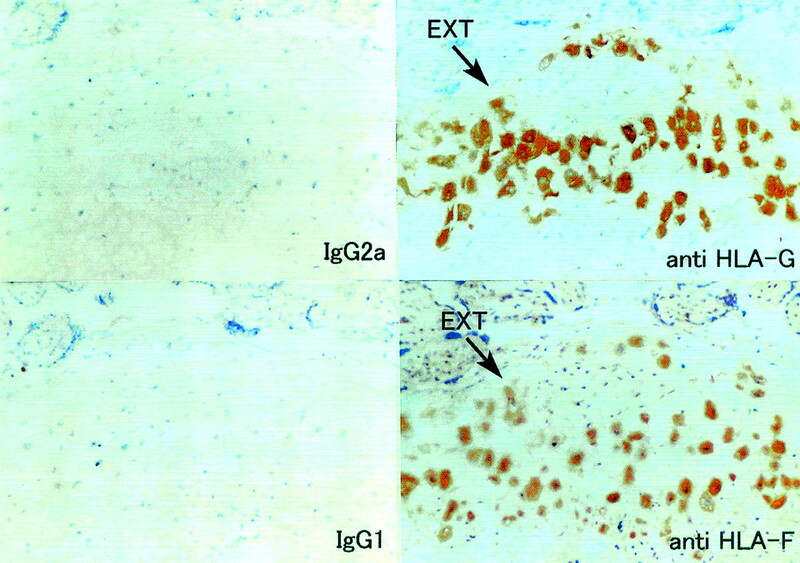 Control staining with isotype-matched control IgG Abs is shown at the left. Because this indicated that expression of HLA-F was differentially expressed and unregulated when trophoblasts entered the decidual environment, we asked whether HLA-F was then expressed on the cell surface of these cells. 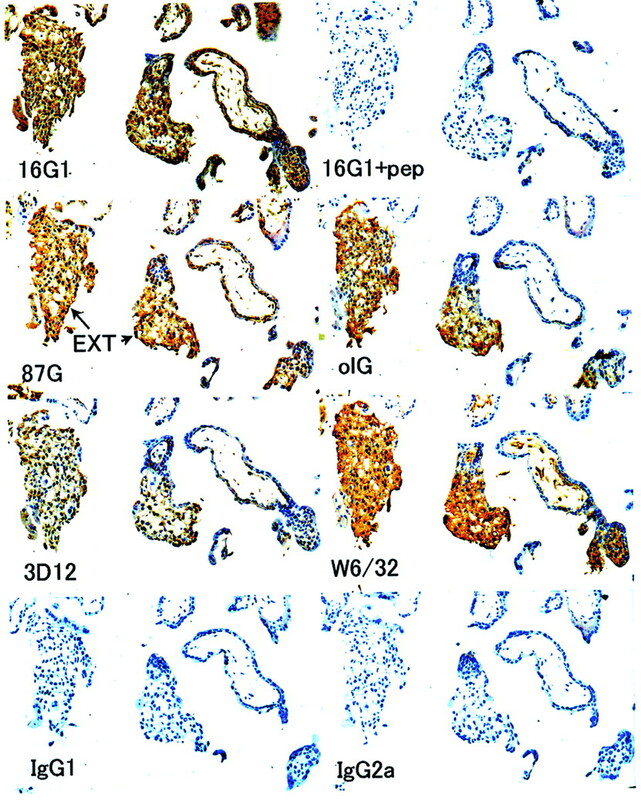 Because isolation of such cells for FACS analysis was not possible in sufficient numbers for unambiguous testing, we conducted histochemical staining of decidual tissue using simultaneously 87G and 3D11 labeled with FITC and Cy3, respectively. A representative example of these experiments is shown (Fig. 6⇓), where clear staining of surface expressed HLA-G can be seen and compared with the expression of HLA-F on precisely the same cells. HLA-F staining could be localized to the cell membrane, as overlapping views of the two Abs demonstrate (Fig. 6⇓, center). HLA-F is expressed on the surface of extravillous trophoblasts in the decidua simultaneously with HLA-G. Green (FITC-labeled 87G) and red (Cy3-labeled 3D11) fluorescent-labeled Abs were used to simultaneously stain decidual tissue containing extravillous trophoblasts as described in Materials and Methods. The three distinct color views of a single section are presented detecting HLA-G (left) and HLA-F (right). Overlaps of M · HLA-G and HLA-F are evidenced by yellow (red + green) staining (center). These studies have examined the expression of HLA-E, F, and G in the placenta in an attempt to test the hypothesis that all three nonclassical class I molecules collaborate in accommodating the allogeneic offspring to the maternal immune response. It has long been known that M · HLA-G is expressed in extravillous cytotrophoblasts, with conflicting reports about expression in other placental cells. Using Abs that distinguish the soluble and membrane forms of HLA-G, we demonstrated that S · HLA-G is expressed in all trophoblasts, including syncitiotrophoblasts. This result has been reported (8), but it had been disputed in other studies (2). Although HLA-G is expressed throughout the maternal placental interface, and the S · HLA-G protein is apparently well distributed in maternal blood at the interface, the peptides bound to HLA-G are apparently quite restricted in number and type. The coexpression of HLA-E in all cells that express HLA-G (in either membrane, soluble form or both) implies that HLA-E binds the HLA-G-derived nonamer in those cells, and therefore may perform a unique function in the placenta (28). The coincident expression of HLA-F in trophoblasts that have invaded the maternal decidua provides the first essential support for our model that all three class Ib molecules collaborate in this unique immune environment. Further, the detection of HLA-F coincident with HLA-G on the surface of these cells is the first evidence of HLA-F surface expression on any cell type. When HLA-G was first discovered, its low allelic polymorphism and restricted expression in cells that do not express classical class I raised the possibility that it was acting as a surrogate class I Ag, replacing the function of HLA class I in Ag presentation and possibly other class I-like functions, such as with NK and ILT receptor interactions. The ability to bind a broad array of peptides (15, 16) and the ability to bind CD8 (18) were consistent with the possibility of Ag presentation as part of a normal function of HLA-G. However, data presented in this study show clearly that the in vivo peptide-binding repertoire of HLA-G is quite restricted, much more so than had been predicted from earlier studies, providing further evidence against an Ag-presenting role for this molecule. Indeed, with approximately one-seventh of S · HLA-G molecules binding a single peptide species, it would appear that the role of peptide is to primarily stabilize the HLA-G complex. It is interesting to note that this peptide is derived from a cytokine receptor-like molecule (34) and to consider whether sequence specificity imparts any unique functionality on the complex. Peptide-dependent interactions with HLA class I and NK receptors have been described (35, 36) as have peptide-dependent interactions of HLA-E with CD94/NKG2 receptors (28). However, while such considerations should be part of any functional examination of HLA-G, peptide affinity and relative abundance may provide an alternative explanation. 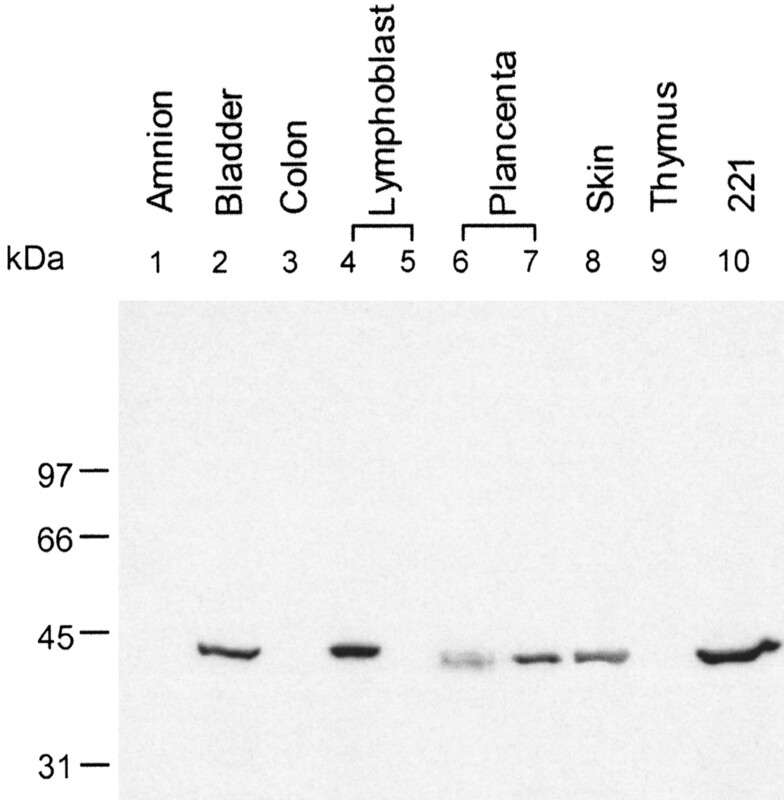 Relatively high levels of expression of the mRNA encoding the protein from which this peptide is derived have been reported from placental tissue (34). Regardless, the restricted pattern of peptide binding to HLA-G in vivo clearly argues against HLA-G participating in Ag presentation for T cell immunity. HLA-G has been implicated in protecting cells from NK lysis (22, 23, 24), and this is now thought to be mediated through an interaction with the NK receptor KIR 2DL4 (25, 26). However, a direct demonstration of such an interaction has not yet been reported. An alternative or additional functionality might be to interact with inhibitory ILT receptors (37). HLA-G tetramers were shown to bind ILT2 and ILT4, suggesting an active role through this receptor (21), and other HLA class I interact with these receptors as well (38). For example ILT4, which is selectively expressed in monocytes, macrophages, and dendritic cells, binds classical class I molecules and transduces negative signals that can inhibit early signaling events triggered by stimulatory receptors (39). This receptor may control inflammatory responses and cytotoxicity mediated by myelomonocytic cells and may modulate their Ag-presenting functions. Therefore, an essential function of HLA-G may indeed be to act as surrogate to classical class I to partially inhibit an alloreactive response through interaction with classical receptors. The presence of HLA-E in all cells that express HLA-G suggests a specific role in the placenta, as binding of the HLA-G-derived nonamer confers a unique activatory function on HLA-E (28) and appears to stabilize the molecule uniquely (40). The HLA-E/G nonamer complex interacts with the CD94/NKG2C receptor as does HLA-E complexed with other class I-derived nonamers. However, the G-nonamer interaction appears to be more robust and specific (28). The single Phenylalanine residue change in the HLA-G-derived nonamer peptide could conceivably alter the interaction site with the receptors, as this residue may be bulging out from the peptide binding pocket (29, 41). An interesting speculation comes from the modeling of the HLA-E CD94/NKG2 complex structure, where the single residue changes of other NKG2 proteins (29), specifically NKG2E, suggest the possibility for a distinct interaction site between this receptor and others. Indeed, NKG2E is highly homologous to NKG2C. If such a specific interaction were to occur, it may act to stimulate NK to secrete cytokines of specific benefit for the implanted embryo. At the same time, it is possible that HLA-G interacts with an inhibitory KIR receptor to balance the activation signal conferred by HLA-E/G nonamer, resulting in a net inhibition of lysis while allowing other activatory pathways to proceed (e.g. cytokine secretion). The finding of HLA-G null individuals (42) suggests that HLA-G is not essential for a healthy pregnancy. However, the ability of even the HLA-G*0105N gene to provide peptide to HLA-E suggests that any such activatory interaction between HLA-E and its receptor in placental cells may be necessary and sufficient for an effective stimulation. Therefore, the possibility exists that the only essential function of HLA-G is to provide peptide for HLA-E expression and specific receptor interaction, the latter being perhaps beneficial but not necessary. The finding that the third nonclassical Ag, HLA-F, is also expressed in the placenta adds to both the growing knowledge of class I expression in this special immune environment and addresses the beginnings of our understanding of HLA-F function. Although it is not yet clear what role HLA-F plays in the immune response, it has long been reported that the gene is differentially expressed in immune cells (11). Protein expression has been detected in several cell types, although no surface expression has been reported (13, 15). Like HLA-G and other HLA class I proteins (39, 43, 44), tetramer binding suggests that HLA-F may interact with ILT2 and ILT4 receptors (12), although no physiological interaction has been demonstrated. This report is the first supplying evidence for HLA-F surface expression, thus opening the possibility that HLA-F function has a receptor-ligand interaction as its foundation. Given that the availability of peptide controls HLA class I surface expression, and that the peptide binding grove of HLA-F appears intact and functional (45), the possibility then exists that HLA-F surface expression is controlled by the availability of peptide as has been demonstrated for HLA-E. The type and specificity of peptide or another biochemical factor expressed uniquely in trophoblasts that have invaded the decidua, vs those in the placental bed, might be indicative of such an agent. The observation that HLA-F is expressed primarily in trophoblasts that have invaded the maternal decidua, and that these same cells simultaneously express HLA-E and G, provides the first example of cells that express all three nonclassical class I Ags simultaneously. The fact that these cells are directly implanted in the maternal decidua in direct contact with maternal immune cells is further suggestive that all three Ags are essential for maternal accommodation of the foreign allograft that this stage of human life represents. Whereas early investigations of HLA expression in human placental tissue led to the hypotheses of HLA-G as a key element in this accommodation, it now appears that the other two nonclassical Ags may also be essential. In addition, specific peptide binding in HLA-G and indeed the specificity of the nonamer peptide that HLA-G uniquely makes available to HLA-E offer clear evidence of interactions and synergy between these molecules. Thus, considering the function of each individually may be only the beginning of our understanding of maternal immune accommodation, and instead a complete understanding will require consideration of the combined and interactive effects of all three proteins. We thank Laura Braun Jones for helpful technical assistance. ↵1 This work was supported by the Bristol-Myers Squibb Pharmaceutical Research Institute (to H.M.). A.I. was supported in part by Grant-in-Aid 05671391 from the Ministry of Education, Science and Culture in Japan and by National Institutes of Health Grant AI49213. D.E.G. was supported by National Institutes of Health Grants AI38508 and AI49213. ↵3 Abbreviations used in this paper: S · HLA-G, soluble HLA-G; ILT, Ig-like transcript; KIR, killer Ig-related receptor; M · HLA-G, membrane HLA-G; β2-m, β2-microglobulin; IEF, isoelectric focusing; TFA, trifluoroacetic acid; LCL, lymphoid cell lines. Sargent, I. L.. 1993. Maternal and fetal immune responses during pregnancy. Exp. Clin. Immunogenet. 10:85. Le Bouteiller, P., A. M. Rodriguez, V. Mallet, M. Girr, T. Guillaudeux, F. Lenfant. 1996. Placental expression of HLA class I genes. Am. J. Reprod. Immunol. 35:216. Loke, Y. W., S. Hiby, A. King. 1999. Human leucocyte antigen-G and reproduction. J. Reprod. Immunol. 43:235. Geraghty, D. E., B. H. Koller, H. T. Orr. 1987. A human major histocompatibility complex class I gene that encodes a protein with a shortened cytoplasmic segment. Proc. Natl. Acad. Sci. USA 84:9145. Kovats, S., E. K. Main, C. Librach, M. Stubblebine, S. J. Fisher, R. DeMars. 1990. A class I antigen, HLA-G, expressed in human trophoblasts. Science 248:220. Ishitani, A., D. E. Geraghty. 1992. Alternative splicing of HLA-G transcripts yields proteins with primary structures resembling both class I and class II antigens. Proc. Natl. Acad. Sci. USA 89:3947. Fujii, T., A. Ishitani, D. E. Geraghty. 1994. A soluble form of the HLA-G antigen is encoded by a messenger ribonucleic acid containing intron 4. J. Immunol. 153:5516. Chu, W., M. E. Fant, D. E. Geraghty, J. S. Hunt. 1998. Soluble HLA-G in human placentas: synthesis in trophoblasts and interferon-γ-activated macrophages but not placental fibroblasts. Hum. Immunol. 59:435. Lee, N., D. R. Goodlett, A. Ishitani, H. Marquardt, D. E. Geraghty. 1998. HLA-E surface expression depends on binding of TAP-dependent peptides derived from certain HLA class I signal sequences. J. Immunol. 160:4951. King, A., D. S. Allan, M. Bowen, S. J. Powis, S. Joseph, S. Verma, S. E. Hiby, A. J. McMichael, Y. W. Loke, V. M. Braud. 2000. HLA-E is expressed on trophoblast and interacts with CD94/NKG2 receptors on decidual NK cells. Eur. J. Immunol. 30:1623. Geraghty, D. E., X. H. Wei, H. T. Orr, B. H. Koller. 1990. Human leukocyte antigen F (HLA-F): an expressed HLA gene composed of a class I coding sequence linked to a novel transcribed repetitive element. J. Exp. Med. 171:1. Lepin, E. J., J. M. Bastin, D. S. Allan, G. Roncador, V. M. Braud, D. Y. Mason, P. A. van der Merwe, A. J. McMichael, J. I. Bell, S. H. Powis, C. A. O’Callaghan. 2000. Functional characterization of HLA-F and binding of HLA-F tetramers to ILT2 and ILT4 receptors. Eur. J. Immunol. 30:3552. Wainwright, S. D., P. A. Biro, C. H. Holmes. 2000. HLA-F is a predominantly empty, intracellular, TAP-associated MHC class Ib protein with a restricted expression pattern. J. Immunol. 164:319. Bainbridge, D., S. Ellis, P. Le Bouteiller, I. Sargent. 2001. HLA-G remains a mystery. Trends Immunol. 22:548. Lee, N., A. R. Malacko, A. Ishitani, M. C. Chen, J. Bajorath, H. Marquardt, D. E. Geraghty. 1995. The membrane-bound and soluble forms of HLA-G bind identical sets of endogenous peptides but differ with respect to TAP association. Immunity 3:591. Diehl, M., C. Munz, W. Keilholz, S. Stevanovic, N. Holmes, Y. W. Loke, H. G. Rammensee. 1996. Nonclassical HLA-G molecules are classical peptide presenters. Curr. Biol. 6:305. Fournel, S., M. Aguerre-Girr, X. Huc, F. Lenfant, A. Alam, A. Toubert, A. Bensussan, P. Le Bouteiller. 2000. Cutting edge: soluble HLA-G1 triggers CD95/CD95 ligand-mediated apoptosis in activated CD8+ cells by interacting with CD8. J. Immunol. 164:6100. Sanders, S. K., P. A. Giblin, P. Kavathas. 1991. Cell-cell adhesion mediated by CD8 and human histocompatibility leukocyte antigen G, a nonclassical major histocompatibility complex class 1 molecule on cytotrophoblasts. J. Exp. Med. 174:737. Le Gal, F. A., B. Riteau, C. Sedlik, I. Khalil-Daher, C. Menier, J. Dausset, J. G. Guillet, E. D. Carosella, N. Rouas-Freiss. 1999. HLA-G-mediated inhibition of antigen-specific cytotoxic T lymphocytes. Int. Immunol. 11:1351. Bainbridge, D. R., S. A. Ellis, I. L. Sargent. 2000. HLA-G suppresses proliferation of CD4+ T-lymphocytes. J. Reprod. Immunol. 48:17. Chumbley, G., A. King, K. Robertson, N. Holmes, Y. W. Loke. 1994. Resistance of HLA-G and HLA-A2 transfectants to lysis by decidual NK cells. Cell Immunol. 155:312. Khalil-Daher, I., B. Riteau, C. Menier, C. Sedlik, P. Paul, J. Dausset, E. D. Carosella, N. Rouas-Freiss. 1999. Role of HLA-G versus HLA-E on NK function: HLA-G is able to inhibit NK cytolysis by itself. J. Reprod. Immunol. 43:175. Munz, C., N. Holmes, A. King, Y. W. Loke, M. Colonna, H. Schild, H. G. Rammensee. 1997. Human histocompatibility leukocyte antigen (HLA)-G molecules inhibit NKAT3 expressing natural killer cells. J. Exp. Med. 185:385. Rajagopalan, S., E. O. Long. 1999. A human histocompatibility leukocyte antigen (HLA)-G-specific receptor expressed on all natural killer cells [Published erratum appears in 2000 J. Exp. Med. 191:2027.]. J. Exp. Med. 189:1093. Lee, N., M. Llano, M. Carretero, A. Ishitani, F. Navarro, M. Lopez-Botet, D. E. Geraghty. 1998. HLA-E is a major ligand for the natural killer inhibitory receptor CD94/NKG2A. Proc. Natl. Acad. Sci. USA 95:5199. Llano, M., N. Lee, F. Navarro, P. Garcia, J. P. Albar, D. E. Geraghty, M. Lopez-Botet. 1998. HLA-E-bound peptides influence recognition by inhibitory and triggering CD94/NKG2 receptors: preferential response to an HLA-G-derived nonamer. Eur. J. Immunol. 28:2854. Strong, R. K., M. A. Holmes, P. Li, L. Braun, N. Lee, D. E. Geraghty. 2003. HLA-E allelic variants: correlating differential expression, peptide affinities, crystal structures and thermal stabilities. J. Biol. Chem. 278:5082. Schatz, P. J.. 1993. Use of peptide libraries to map the substrate specificity of a peptide-modifying enzyme: a 13 residues consensus peptide specifies biotinylation in Escherichia coli. Biotechnology (NY) 11:1138. Maresh, G. A., W. C. Wang, K. S. Beam, A. R. Malacko, I. Hellstrom, K. E. Hellstrom, H. Marquardt. 1994. Differential processing and secretion of the melanoma-associated ME20 antigen. Arch. Biochem. Biophys. 311:95. Shimizu, Y., D. E. Geraghty, B. H. Koller, H. T. Orr, R. DeMars. 1988. Transfer and expression of three cloned human non-HLA-A,B,C class I major histocompatibility complex genes in mutant lymphoblastoid cells. Proc. Natl. Acad. Sci. USA 85:227. Pei, J., J. Rosielle, J. Hansen, E. Mickelson. 2002. The IHWG cell and gene bank 2002: a comprehensive repository of reference reagents for analysis of the human MHC and immune regulator genes. Hum. Immunol. 63:S108. Devergne, O., M. Hummel, H. Koeppen, M. M. Le Beau, E. C. Nathanson, E. Kieff, M. Birkenbach. 1996. A novel interleukin-12 p40-related protein induced by latent Epstein-Barr virus infection in B lymphocytes. J. Virol. 70:1143. Rajagopalan, S., E. O. Long. 1997. The direct binding of a p58 killer cell inhibitory receptor to human histocompatibility leukocyte antigen (HLA)-Cw4 exhibits peptide selectivity. J. Exp. Med. 185:1523. Peruzzi, M., N. Wagtmann, E. O. Long. 1996. A p70 killer cell inhibitory receptor specific for several HLA-B allotypes discriminates among peptides bound to HLA-B*2705. J. Exp. Med. 184:1585. Samaridis, J., M. Colonna. 1997. Cloning of novel immunoglobulin superfamily receptors expressed on human myeloid and lymphoid cells: structural evidence for new stimulatory and inhibitory pathways. Eur. J. Immunol. 27:660. Colonna, M., F. Navarro, T. Bellon, M. Llano, P. Garcia, J. Samaridis, L. Angman, M. Cella, M. Lopez-Botet. 1997. A common inhibitory receptor for major histocompatibility complex class I molecules on human lymphoid and myelomonocytic cells. J. Exp. Med. 186:1809. Colonna, M., J. Samaridis, M. Cella, L. Angman, R. L. Allen, C. A. O’Callaghan, R. Dunbar, G. S. Ogg, V. Cerundolo, A. Rolink. 1998. Human myelomonocytic cells express an inhibitory receptor for classical and nonclassical MHC class I molecules. J. Immunol. 160:3096. Vales-Gomez, M., H. T. Reyburn, R. A. Erskine, M. Lopez-Botet, J. L. Strominger. 1999. Kinetics and peptide dependency of the binding of the inhibitory NK receptor CD94/NKG2-A and the activating receptor CD94/NKG2-C to HLA-E. EMBO J. 18:4250. O’Callaghan, C. A., J. Tormo, B. E. Willcox, V. M. Braud, B. K. Jakobsen, D. I. Stuart, A. J. McMichael, J. I. Bell, E. Y. Jones. 1998. Structural features impose tight peptide binding specificity in the nonclassical MHC molecule HLA-E. Mol. Cell 1:531. Ober, C., C. Aldrich, B. Rosinsky, A. Robertson, M. A. Walker, S. Willadsen, M. S. Verp, D. E. Geraghty, J. S. Hunt. 1998. HLA-G1 protein expression is not essential for fetal survival. Placenta 19:127. Lopez-Botet, M., F. Navarro, M. Llano. 1999. How do NK cells sense the expression of HLA-G class Ib molecules?. Semin. Cancer Biol. 9:19. Navarro, F., M. Llano, T. Bellon, M. Colonna, D. E. Geraghty, M. Lopez-Botet. 1999. The ILT2(LIR1) and CD94/NKG2A NK cell receptors respectively recognize HLA-G1 and HLA-E molecules co-expressed on target cells. Eur. J. Immunol. 29:277. O’Callaghan, C. A., J. I. Bell. 1998. Structure and function of the human MHC class Ib molecules HLA-E, HLA-F and HLA-G. Immunol. Rev. 163:129.